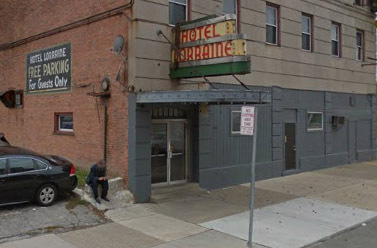 Toledo investors have bought the Lorraine Motor Hotel on Jefferson Ave. downtown and plan to renovate it? Indeed, it’s true, according to this June, 2017 story in The Blade (that actually uses the word “seedy” in the headline). The hourly rooms are gone, apparently. The bigger shock to me was that the Lorraine was still standing, let alone open. It’s the kind of place that have mostly been torn down (or burned, like the Earle Hotel) over the years. 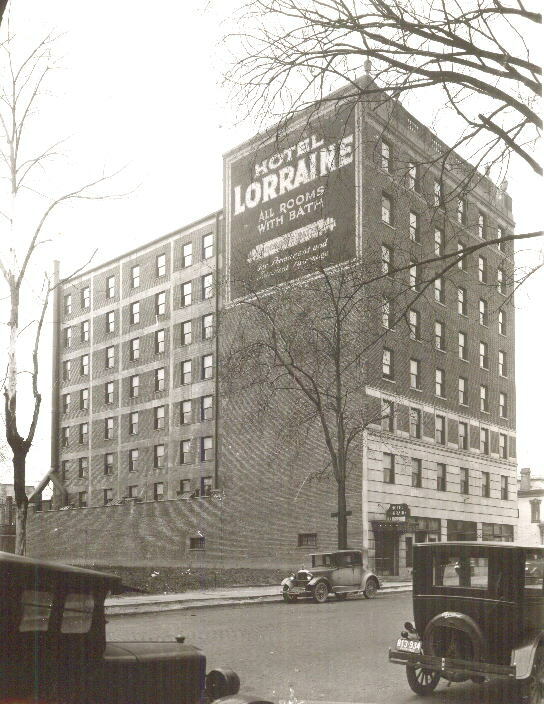 The Hotel Lorraine in 1926. Photo courtesy of the Toledo-Lucas County Public Library, obtained from http://images2.toledolibrary.org/. It opened on April 15, 1925. An ad from the Toledo News-Bee of April 14, 1925, trumpeting the opening of the Lorraine. First ceremonies leading up to the formal opening of Hotel Lorraine on Wednesday were held on Monday night when J.A. 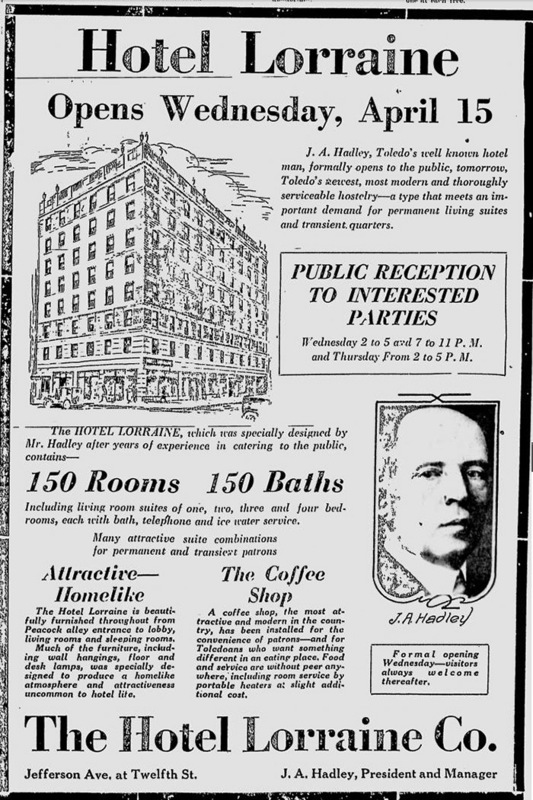 Hadley, president and manager of the Hotel Lorraine Co., entertained hotel men of Toledo with a dinner at the recently completed hotel. The dinner was preceded by an inspection trip thru the hotel. The formal public inspection will be held on Wednesday afternoon and evening from 2 to 5 and 7 to 11. Hotel men pronounced the hotel to be the last word in modern construction, equipment and furnishings. The building, located at Jefferson-av and Twelfth-st, is an eight-story, fireproof, concrete building faced with brick. Parts of the four upper floors are thrown into family suites, the lower floors being constructed for individual rooms. Every room or every suite in the building has a bath and is equipped with three clothes closets. The closets, especially, received the commendation of hotel men who declared they represented a new idea in hotel construction. Woodwork throughout is black walnut finish. To harmonize with this is black walnut furniture thruout the rooms and carefully selected draperies and shades. The carrying of ice water by bellhops, the standard hotel necessity, especially in the summer months, will be eliminated by ice water lines to all rooms. A large ice machine in the basement of the building refrigerates the water for the rooms in connection with meeting kitchen needs. A dining room is located on the first floor, facing Twelfth-st.
Hadley was no slouch in in the hotel business in Toledo: a search shows he was the manager of the Secor Hotel prior to his opening the Lorraine. The Secor was Toledo’s nicest hotel for a long time until the Commodore Perry opened in 1927 – and Hadley went over to the Commodore to manage it. Hey, while we’re in the neighborhood, it’s worth mentioning the Lorraine was on the edge of one of Toledo’s most infamous districts in the 1970s: the Jefferson Avenue Circus. The “Circus,” not ever to be confused with an actual big top, was a stretch of bars along Jefferson that was a well-known hotbed of prostitution and drugs – with the Greyhound bus station squarely in the middle. The first reference I can find about it was in September 1970, when City Council heard from three well-known Toledoans – councilman and future Ohio Supreme Court Justice Andy Douglas, The Rev. Leonard Klippen, executive director of the Toledo Area Council of Churches, and Erie Chapman, the retiring executive director of the YMCA at 11th and Jefferson – who described how they had been soliticited by prostitutes in Jefferson Avenue bars while investigating accusations made by the Patrolmen’s Benevolent Association (over, apparently, whether something should be done about the area, which ran from Erie to 12th and Monroe to Madison). Douglas said he was solicited three times. Klippen said he was propositioned twice, the first time 25 seconds after he walked in to a bar. Mayor William Ensign and Toledo Police Captain William Gray, chief of detectives on the overnight shift, engaged in a bitter argument at the meeting over whether Gray should make arrests when he sees such violations. Meanwhile, Gray blamed inattention by the mayor for allowing the situation to get out of hand. This displeased The Blade’s editorial writers no end. Shortly thereafter, The Blade wrote this editorial laying out the situation, and blaming not only city leaders but Captain Gray, chief of detectives on the overnight shift since 1963. The shabby conditions that now prevail along Jefferson Avenue in the downtown area ought to be of crucial concern to all. The sleazy, honky-tonk atmosphere that encourages prostitution and other illicit activities should be eradicated – and quickly – before the blight infests a larger part of the community. At the same time, there is a lot of plain hypocrisy resounding over who is primarily to blame, what the remedy is, and why nothing is supposedly being done by the Ensign administration to tackle an admittedly serious problem. And nowhere does some of this high-blown rhetoric seem more out of place or more self-serving than that issuing from the lips of Capt. William Gray, veteran Toledo police officer. Captain Gray has been making plenty of noise recently over the conditions on Jefferson Avenue in an obvious effort to embarrass the administration as well as his own police division leadership. This stems in no small way from the impression widely held that his slow burn has been caused primarily by the cold shoulder given whatever ambitions he may have harbored of becoming chief of police. One thing the city could have done was actually contest the issuance of liquor permits in the area by the State of Ohio. The fact that they didn’t came to light when a state liquor official and assistant county prosecutor chided the city over their complaints about the Jefferson Avenue situation but doing nothing about it. But September, 1970 was a tumultuous month in Toledo. Teachers in the Toledo Public Schools went on strike for nine days. Toledo Police Patrolman William Albert Miscannon, 33, was killed Sept. 18 as he sat in his patrol wagon on Junction Ave. at Dorr St., which started a gun battle at the Black Panther headquarters on Dorr St. Prior to being named the Starlight Bar it was called the Rex Bar for several years. I was a young writer back then and liked going to those types of places as they fascinated me and usually led to some creative writing. I believe the Starlight eventually burned down. Enjoy your websight and appeciate all the work you put into it.